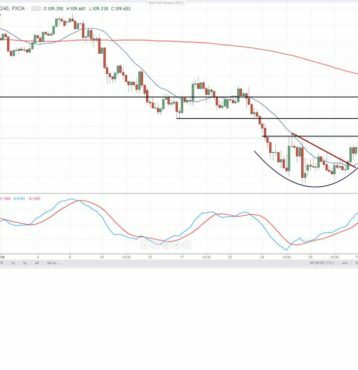 It looks like a rounding bottom pattern on the four-hour chart and the pair also broke above the short-term bearish trendline, leaving the intraday outlook slightly more bullish. The resistance is located at 109.70 and if broken, the pair might rise to previous swing lows around 110.25. On the other hand, the support for today’s trading is seen near 109.45 and if not held, bears could push the pair back to 109.00. In all cases we strongly recommend to have rigorous money and risk management. The greenback pushed higher against the yen and the USDJPY pair was trading around 109.60 during the London session on Thursday, some 0.60% stronger on the day. Wednesday brought some important macro news for the US dollar, namely the ADP report for January, which eased slightly from 247,000 to 234,000, but managed to surpass analysts’ expectations of 186,000. In addition, the latest FOMC policy update signalled central bank’s confidence about inflation and provided a minor boost to the US Dollar. Traders will now focus on today’s ISM manufacturing survey, which should slow marginally to 58.7 from 59.7 previously.